Pat Sherwood addresses the concept of clever simplicity in fitness and life. CrossFit places great importance on the concept of elegance. 1. Tasteful in dress, style or design. 2. Dignified and graceful in appearance, behavior, etc. 3. Cleverly simple; ingenious. As in an elegant solution to a problem. I’m now in love with the third definition. Pat Sherwood isn’t lost in Central America and doesn’t want your god-damn help. Mistakes made and lessons learned. Motorcycle nomad Pat Sherwood says he understands the lure of gangs—and he’s proud to be a member of the CrossFit crew. Road warrior leaves home with seven pairs of socks and discovers one of life’s great secrets. Pat Sherwood explains the delicate balance between pupusa and push-ups. Good article, Pat. Ice cream and handstands all day! Phenomenal content. Beautifully written. Thank you. Well written. I need to memorize parts of this so I can better explain it to the curios. Thank you for this awesome article Pat! As George Ryan would say, "You knocked it out of the park". This is a fantastic, yet short article; from my point of view it would fit the training guide perfectly (just after "Fundamentals, Virtuosity, and Mastery"). Pat, interesting article. I have always been impressed with many of the simple 'one-liners' that from CrossFit. Here are two thoughts I had while reading. First, with respect to the 'Equation for Fitness'. 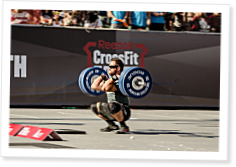 It is beautifully simple, and as you described, elegant, and describes how CrossFit makes you fitter. BUT, you would never say just that to a first-time CrossFit beginner. Elegant solution to a problem juxtaposed against a much more complex of explanation. For example, the link "What is CrossFit" off the mainpage, only mentions it in parenthesis in the second paragraph. Not a slight, just a thought I had. The sentence makes perfect sense to me because I understand it. What is the most effective (elegant?) way to help someone understand that concept? Second, when you compared rep schemes and said "The second workout looks like someone threw up on the page. It’s not beautiful and it doesn’t flow. There’s nothing cleverly simple about it." My question to you is, so what?! Does one work better than the other? Do I get more gains, faster and safer with one route? If no, then so what? If yes, then the other should probably be thrown out. Why not "Complete 45 reps each of 225-lb deadlifts and handstand push-ups for time" ? I would write a long comment, but I have the time.